Pre-settlement risk (PSR) is the risk that a counterparty to a transaction, such as a forward contract, will not settle or honour his/ her end of the deal. PSR limits are based on the worst case loss that is likely to occur if the counterparty defaults prior to the settlement of the transaction. The worst case loss assumes an adverse movement in the price/ rate, a client default and the subsequent cost of re-covering the transaction again from the open market. Therefore in setting a counterparty risk limit all three of these factors need to be considered, i.e. As the counterparty risk limit is based on the worst case scenario, a VaR based approach has been used in calculating the PSR limits. For example let us assume that a client of our bank anticipates that the price of crude is likely to increase past USD 83 in the next ten days. To benefit from this position, he enters into a forward contract with our trading desk to purchase 1000 barrels of WTI Crude Oil 10 days from now for USD 83 per barrel, i.e. for USD 83,000. Currently the price of the crude is USD 81.45 (January 2011) per barrel. If the bank were to default on the deal, our client would have to cover the position by purchasing 1000 barrels of crude from the market, possibly at a price much higher than the current price. The difference between this higher price and the contract value is the loss that he would suffer on the deal. 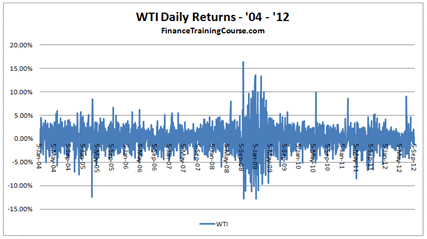 Over the past year (2010-2011) crude oil price has experienced an average daily volatility of 1.94%. This daily volatility has been calculated using the Simple Moving Average (SMA) approach. The volatility over the pre-settlement period therefore is 6.12% (=1.94%*sqrt(10)). Given this volatility pre-settlement period price impact would be USD 4.98 (=81.45*6.12%), i.e. the price impact is a function of the current price and pre-settlement period volatility. 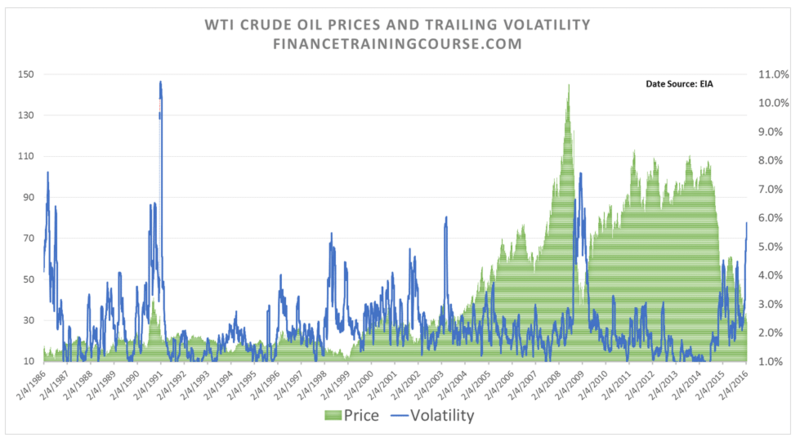 Oil Price volatility – 30 year overview. This pre-settlement period price impact may also be denoted as the 1-sigma price impact as the pre-settlement volatility is considered as is and is not enhanced by any factor. This means that given the volatility, the price of crude is expected to move by around USD 4.98 in the next ten days. However, when determining the PSR Limit we are not merely concerned in determining what the price impact is for a 1-sigma move in prices. What we are really interested in the worst case loss over this period. This worst case loss incorporates a multiple of the volatility into the calculation. The multiple is based on a confidence level or the probability that such an event is likely to occur and is usually taken as 99%. Based on this confidence level the multiple is 2.33 (=the inverse of the standard normal cumulative distribution function at 99% probability) times the volatility or 2.33-sigma. Recall that VaR, in particular for SMA (or EWMA) VaR, is a function of the SMA (or EWMA) volatility and the inverse of the standard normal cumulative distribution. Hence the PSR limit in this case is based on the 10-day holding VaR at the 99% confidence level. The worst case price shock is the pre-settlement price impact times the multiple, i.e. 4.98*2.33 = 11.595. This means that during the period before settlement there is a 1% chance that crude oil price will exceed the current price by more than USD 11.595. 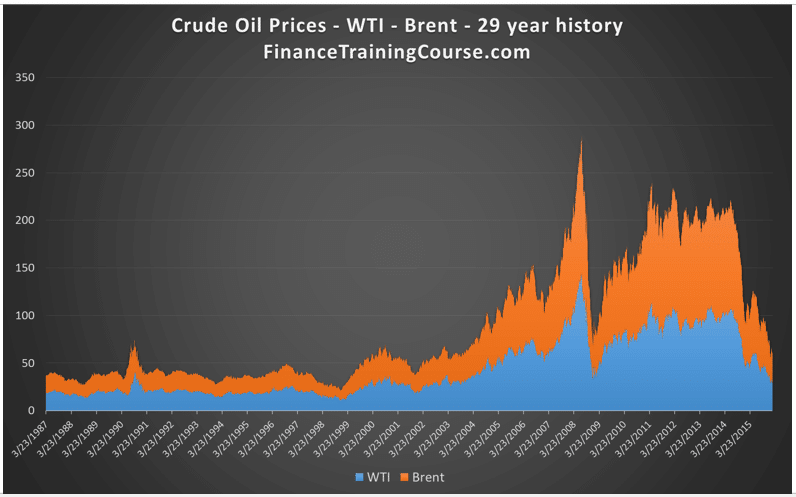 The total worst case shock to the current price therefore will be set as the worst case price shock times the number of barrels of crude that would be purchased. This works out to USD 11,595 (=11.595*1000). The market value based on the worst case shock will be USD 93,045 = [(81.45+11.595)*1000]. Let us consider another example. The same client enters into a forward contract with the trading desk to exchange EUR 100,000 for USD 141,000 after ten days. Our client anticipates that the EUR-USD rate will fall in the near future and she enters the contract to protect her dollar position. Pre-settlement FX rate impact works out to =1.59%*1.395 =0.022. 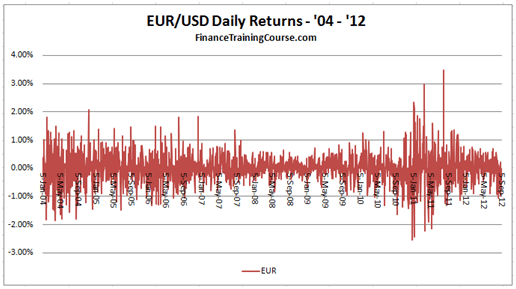 Worst case FX rate shock (at 99% confidence interval) = 0.022 * 2.33 = 0.051, i.e. the EUR-USD rate falls by USD 0.051. The final PSR limit to be determined would also consider the credit worthiness of the counterparty involved in line with how the credit worthiness is assessed for traditional credit lines. In addition to this limit the credit exposure arising from pre-settlement risk should be aggregated with all other credit exposures for that counterparty and be compared with the overall credit limit for that counterparty to ensure that the credit exposure lies within acceptable bounds. Conventionally PSR limits were calculated once a year and updated every year. The approach was to calculate a PSR factor based on products, currencies and exposure and apply it to notional values. With rising volatility in financial market banks now update PSR factors on a weekly basis with some doing factor updates on a daily basis. Settlement risk exists only when the principal cash flows have been exchanged but the delivery of the instrument/ asset has not occurred as yet. They are therefore short term in nature however as the risk involves the exchange of the total notional value of the instrument or the principal cash flow, the total dollar value of the settlement risk exposure tends to be larger in most cases than the credit exposure due to pre-settlement risk. These limits should reflect the credit quality of the counterparty to the transactions, the company’s own capital adequacy, operations efficiency, credit expertise, the efficiency and reliability of the settlement systems and the period of time for which the exposure will be outstanding. The limits would restrict the maximum value of contracts with the same counterparty on the same settlement date. Potential Future Exposure or PFE Limits. Potential Future Exposure (PFE) takes a forward looking approach to tracking how the transaction behaves over its life and the impact of that behavior on counter party credit risk. For multi leg transactions such as interest rate swaps and cross currency swaps it is common to use both PSR and PFE to allocate credit risk limits. Both tools utilize a value at risk based model to forecast worst case market shocks but differ in how that shock impacts credit limit utilization. See Potential Future Exposure (PFE) calculation case study for an Interest Rate Swap.